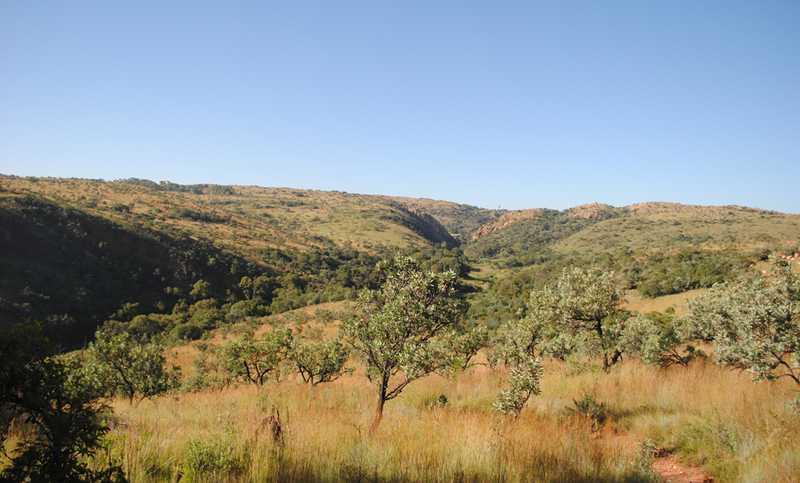 Kings Kloof is situated near Krugersdorp / Muldersdrift on the Laurentia Farm. The trails are all unique compared to any other in the area with beautiful valleys, mountain climbs, river crossings, natural water pools, trees, spectacular views, bird life and much more! It is home to a unique diversity of plant and animal life and forms part of the Crocodile Ramble, a tourist route that runs along the Crocodile River. The trails at Kings Kloof consist of jeep track, rocky single track, river crossings, steep up and downhill sections, endurance testing climbs and some sharp corners. The trails are well marked with several routes to choose from making Kings Kloof the perfect place for all types trail runners. Conditions can be very tough at Kings Kloof and it is highly advised to take enough hydration out on the route and to run in groups. Kings Kloof offers the bare essentials, so come prepared! To get to the start of the trail, park your vehicle behind Laurentia Farm stall, then go to the stall, fill in the entry book, pay the entrance fee and head out on the trails. The trail starts with some easy jeep track and then splits from there into the 3 different routes namely – Black, Red & Green all with different levels of difficulty. Make your pick and enjoy! Terrain: Steep downhills, river crossings, rocky single tracks, sharp corners. Terrain: Steep downhills, river crossings, rocky single tracks. Terrain: Jeep track, single track, mostly flat with some climbing. Access Requirements: R40 entrance fee. Saturdays and Sundays only: 05:30 – 16:00. Facilities: Farm Stall, no toilets. Cell reception: Good, reception on all parts of the trail. Beware: Snakes, ticks, dehydration, falling and mountain bikers. Always carry a cell phone with you; parts of the trail are not accesible by car. Best time of the year: Summer and winter. Directions: Take the N14 towards Krugersdorp. Turn right at the 4-way traffic light just before Silver Star Casino (Sasol garage on the corner). After about 6km you will see Laurentia Farm stall on your left. The entrance and parking is behind the farm stall under the trees.